Brakes are imperative when it comes to ensuring the safety of passengers and the vehicle. Although everybody knows what brakes are and what they do, only a few know how they work. Whether you are planning to buy a new car or get one from a public auto auction, it is important to know the basics of brakes and how they work. To help clear the smokescreen, in this blog, we cover everything you need to know about a car’s braking system. Read on. 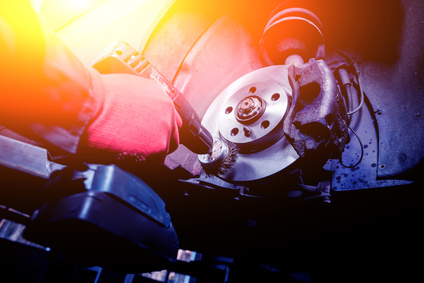 Installed in braking systems of an array of vehicles ranging from cars to jumbo jets, disk brakes are extremely effective and rarely malfunction. In addition to being efficient, disk brakes do not get affected by exposure to water, wears slowly, and are self-cleaning and self-adjusting. Disk brakes are popularly used for front wheels, and often used for rear wheels, too. The main components of disk brakes include a hydraulic system, brake pads, brake rotor, and calipers. Although disk brakes are the best on the market, drum brakes are cost-effective and, therefore, are installed in rear wheels. In addition to being cheap, drum brakes can also be easily customized by adding additional parking brakes. The main components of drum brakes include brake plates, brake shoes, brake drums, return springs, and wheel cylinder. Master cylinder is a device that converts force into hydraulic pressure. Usually, in a hydraulic system, there are two separate master cylinders in one housing, each controlling two wheels. When you apply the brakes, the brake pedal applies pressure on a piston. The pressure increases as the brake pedals are completely pressed. As a result of the built-up pressure, a secondary piston is forced to compress the fluid in the hydraulic circuit. The liquid is sent to the drum or disc brakes through brake lines that slows down the vehicle. Brake fluid is a special type of oil that has specific properties. The brake fluid can withstand extreme temperatures and does not thicken or boil when exposed to extreme cold or hot temperatures. The brake fluid is stored in a brake reservoir that is installed on top of the master cylinder. From the master cylinder, the brake fluid travels to the wheels through a steel or rubber tubes. The tubes are called brake lines. The brake lines make sure the fluid reaches the wheels without any intervention, only when the brake pads are pressed. Brake calipers are fitted over brake rotors. A pair of metal plates, also known as brake pads, are fitted inside each caliper. The main objective of calipers is to slow a vehicle’s speed by creating friction between the rotors, resulting in slowing down wheel speed. Brake rotors work hand-in-hand with brake pads to slow down or completely stop a vehicle. Similar to brake pads, even brake rotors are exposed to high friction and can wear out easily, usually in the form of grooves and ridges. It is, therefore, essential to periodically inspect the condition of brake rotors and replace them, if and when required. Two brake pads are mounted inside on either side of each caliper. Brake pads are responsible to create friction to reduce a vehicle’s speed. As it is constantly exposed to high friction, they can wear out easily and need to be replaced periodically. Brakes are an extremely important part of a vehicle that ensures the safety of passengers as well as vehicles. If, however, you are yet to get your hands on your dream car and are looking for a website that hosts public auto auctions, look no further than Salvagebid.com. Besides listing an exhaustive array of options, we also provide all the information you may need to make informed buying decisions. If you have any questions or wish to learn more about any of the vehicles listed with us, simply call +1 (503) 298-4300 or fill out our contact form. To get started, all you need to do is register with us.